Edward Elgar, 2015, 320 pp. 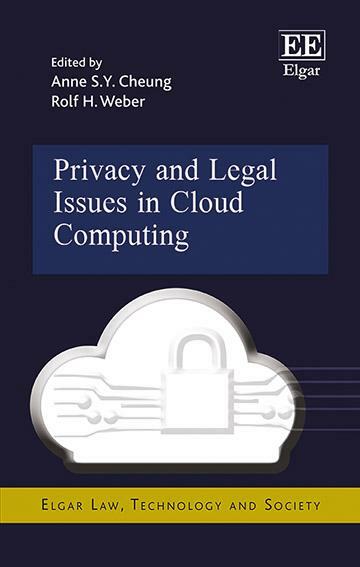 Description: Adopting a multi-disciplinary and comparative approach, this book focuses on emerging and innovative attempts to tackle privacy and legal issues in cloud computing, such as personal data privacy, security and intellectual property protection. Leading international academics and practitioners in the fields of law and computer science examine the specific legal implications of cloud computing pertaining to jurisdiction, biomedical practice and information ownership. This collection offers original and critical responses to the rising challenges posed by cloud computing. An international team of legal scholars, computer science researchers, regulators and practitioners present original and critical responses to the growing challenges posed by cloud computing. They analyse the specific legal implications pertaining to jurisdiction, biomedical practice and information ownership, as well as issues of regulatory control, competition and cross-border regulation. Law academics, practitioners and regulators will find this book to be a valuable, practical and accessible resource, as will computer science scholars interested in cloud computing issues. HKU Faculty chapter contributions: "Introduction: a walk in the clouds" (Anne Cheung & Rolf Weber), "Introduction to cloud computing and security issues" (Joe Kong, Xiaoxi Fan and KP Chow), "Legal safeguards for cloud computing" (Rolf Weber), "Re-personalizing personal data in the cloud" (Anne Cheung), "Lost in translation: Transforming healthcare information for the digital and cloud domains" (Terry Kaan).